Wombat & Wombat Joey Robot Lawn Mowers - they take the hard work out of yard work. 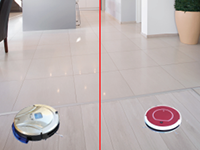 Platypus & Blue Swimmer battery driven pool cleaners - it's safe to swim while they clean. 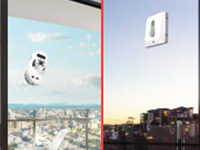 Gecko & Glider window cleaning robots - they can nimbly reach high places and tight spaces. 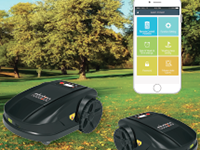 Beetle & Bug Floor cleaners - it's a chore no more to clean the floor with these vacs. 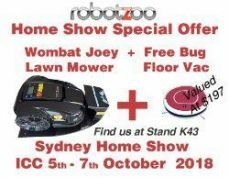 Home Show Visitors who order one of our Wombat Joey Lawn Mowers during the month of October can receive a complimentary RobotZoo Bug floor sweeper. 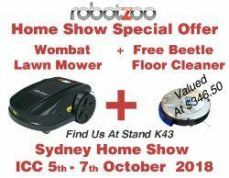 Home Show visitors who order one of our Wombat Lawn Mower during the month of October can receive a complimentary RobotZoo Beetle Floor Cleaner/Mop.